I can tell you're getting ready for summer--I got this Sewing Circle question from a reader the other day! Q: I have been sewing off and on for a few years so I'm pretty comfortable doing complex things, but I don't draft my own patterns. Recently I have been looking for patterns for bathing suits and haven't been able to any. I was just wondering if you knew of any out there, or could give tips on drafting my own pattern (outside of using an existing suit). 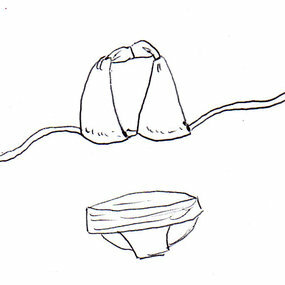 (Optional): Bra cup pads or underwires if applicable, also sold at JoAnn, etc. Here are some of the cutest! BurdaStyle has several super cute ones, some of them free! And of course, if you don't like any of the patterns that are meant for swimwear, you can always adapt an underwear pattern and bra pattern. Those aren't a walk in the park to find, either, but BurdaStyle has some of those too. Readers, what tips do you have for Sarah? 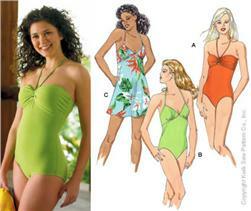 Have you found any great swimsuit patterns? Have you had success or struggles making your own swimsuit?? There is a girl called Giannyl who makes pretty straight-forward video tutorials, and she has one for making a very simple bikini (http://www.giannyl.com/how-to-create-a-bikini/). I have followed her tutorial to make myself a simple bikini top (mine isn't ruffeld though as I just used plain black lycra in double thickness). For the bottom, I wanted something high waisted and quite retro looking. I found a pair of tight trunks I once bought for my boyfriend which he hated and used them as my pattern (It turned out they fit me better than him!). I'm nearly done and it has been fun and quite easy (I'm not the best of sewists). The retro high waisted bikinis on sale are so expensive, for my version I only bought a meter and have some spare fabric which I could use as embellishment (I'm thinking little bows for example). This post is just in time!!! I bought some swimsuit fabric a month ago and want to make my own swimsuit.. I have a pattern in my head somewhere but I didn't know where to go from there... like which needles and lining and thread.. and here I am reading your post! Perfect timing!! Thank you so much!!!! But I want more support and better colors. Good luck to ya, hopefully one of use will get it! I'm scared to try something like this!!! When I end up doing clothes I end up in tears. I love vintage swimsuits as well! I've got a bikini pattern that I'm itching to make and I've got lovely fabric to make it in the only problem is I'm struggling to find lining fabric here in the uk, but this post has made me more determined to find some. Any good sources for quality lining? I also have a couple Kwik Sew patterns I am going to try. Does anyone know a source for a less stretchy swim suit material? More like the nylons they use in Mens swim trunks? I have looked for some thing like this to make a suit with as I want to make a more vintage style suit using a zipper but alas I can not seem to find these available to general public. This is an excellent resource! Great job putting it all together. The patterns you found were exceptionally helpful. I made a swimsuit last year but it didn't turn out great. So this year I'm going to make another one- after learning from my mistakes. The community college nearby has a three week summer class all about sewing swimsuits that I'm going to in a few weeks. Hey, its free and I'm sure it will be somewhat helpful. DO NOT try that Burdastyle bathing suit (the second one down, one piece retro style)! It's free, and I can see why. Just don't try it. It's so poorly designed that you'll go bonkers trying to do it. You'll want to use braided swimwear elastic.They sell this online or you can probably find it at a local fabric store. I've been to a few JoAnn's and only about 1 in 5 has it (personally I'm pretty disillusioned with JoAnn). Make sure it says swimwear elastic- don't use regular elastic. Just trust me, it won't be pretty once you get it wet a few times. Also, you can use rubber elastic but it's NOT forgiving at all. The common size is actually 3/8" for most of the suit, and possibly 1/4" for other odd places. Patternschool.com is AMAZING. I drafted my swimsuit pattern using Adobe Illustrator using it. However, I did a few things wrong when creating it so mine wasn't great. But it is an amazing resource and wealth of knowledge. Great tips and resources, everyone!! Hope that helps, and keep the tips coming! A swim suit, really bikini, is on my bucket list this year. I'm kind of afraid to try except it seems simple. Ill let you know if I ever make one I have a deep turquoise and was looking at a very light turquoise at fashion fabrics.com. do i have to use nylon thread? or can i use poly all purp. thread on a stretch setting? Good question! I think it depends on the pattern and fabric you choose. Read the fine print and if that doesn't give you your answer, sure, try out the all-purpose thread on a sample and see what happens! hey i was wondering if you knew of any patterns that are like the second one(the one-piece) but a two-piece bikini. with an under-wire. I have published a free bikini pattern, if anyone would like to try it.